Visiting Buddhist cultures has always been a rewarding experience for me. I feel that I return a better person, and with strong, enduring images. Just spending time in these gracious cultures and being exposed to the Buddhist philosophy of life, one learns important lessons about spirituality and personal growth. Perhaps it's the continuity that exists within cultures that have had the same life patterns for centuries. Or perhaps it's exposure to the Buddhist people, who are calm, curious, open-minded and welcoming. I feel that Buddhism teaches compassion and encourages us to look within--to live responsibly and correctly. Ladakh is an ancient Tibetan Buddhist area located in northern India in the Himalayan Mountains. 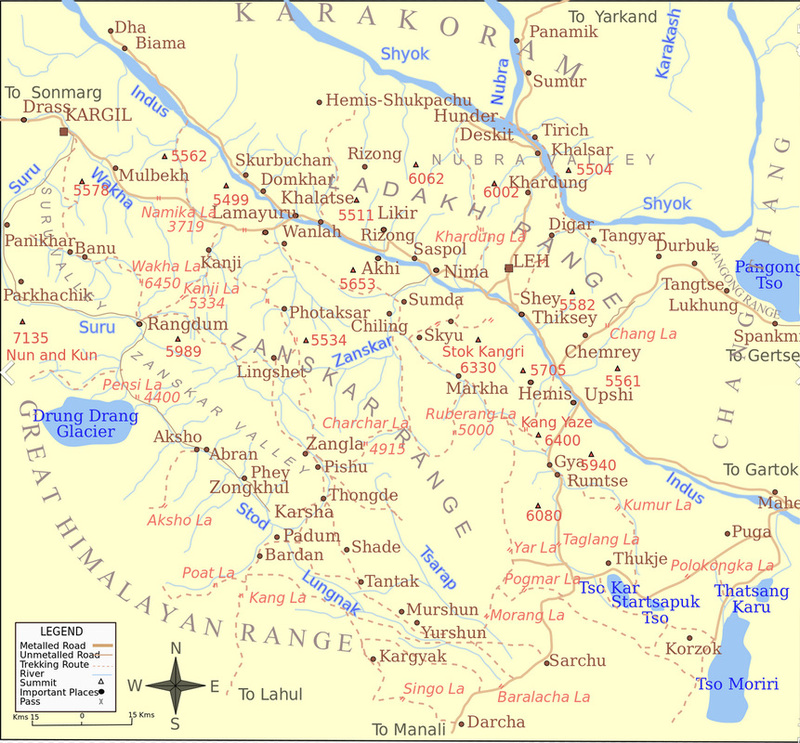 It is bordered by Tibet on the east, China on the north, and Pakistan on the west. Ladakh is often referred to as "Little Tibet" due to the intact and ongoing Buddhist culture, which was spared invasion and destruction by the Chinese in the middle of the twentieth century. Visiting Ladakh allows us to wander through beautiful and remote monasteries, where the practice of Buddhism has not changed for centuries. 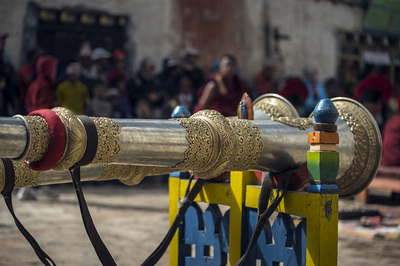 This tour is designed to coincide with the annual elaborate Hemis Festival, which takes place for two days in the Hemis Monastery. During this colorful festival the monks are dressed in elaborate silk gowns and elaborately carved masks. There are very few occasions where these items are taken out of storage and worn. Their dances are accompanied by raucous music from drums, cymbals, conch shells and long brass horns. A spectacular flight across the Indian Himalayas takes us from Delhi north to the barren landscapes of Ladakh. The stark contrast between these windswept hills and the rest of India is immediately apparent as we land at one of the world's highest airports. We will visit all of the major Tibetan monasteries, which are often perched atop tall, jagged Himalayan mountains in ancient, unlikely locations. Colorful prayer flags span wide valleys and mani walls with stones inscribed with Om Mani Padmi Hum (Hail to the jewel of the lotus) line the pathways. The interiors of the monasteries are decorated with elaborate murals and tall statues of bodhisattvas as seen above. While most Ladakhis are cash poor, traditional mud-brick homesteads are large, comfortable and self-sufficient in fuel and dairy products, organic vegetables and barley used to make tsampa (roast barley flour) and chhang (barley booze). Such self-sufficiency is an incredible achievement given the short growing season and very limited arable land in this upland desert, where precious water supplies must be laboriously channeled from glacier-melt mountain streams. A visit to Ladakh is an unforgettable cultural experience--a step back in time and exposure to one of the world's most interesting and inspiring religion--Tibetan Buddhism. Arrive at Delhi International Airport where you will be met and transferred to your hotel. Our stay will be at the Radisson Blu Marina, a centrally located hotel right on Connaught Place. The hotel has comfortable rooms and also offers a bar, coffee shop, and a specialty kabab restaurant. We will transfer to Delhi Domestic Airport to board the morning flight to Leh. Upon arrival at Leh, we will be met and transferred to our hotel for two nights--. The Grand Dragon Hotel. Ladakh's principal town used to be one of the busiest market towns on the caravan trade between India and Central Asia. These days it retains a distinctly central Asian feel. Leh is dominated by the nine-storey Palace, a building in the grand tradition of Tibetan architecture, said to have inspired the famous Potala in Lhasa, which was built half a century later. The best way to see Leh is on a walking tour. Along the main street the Buddhist women with their tall hats chatter freely as they sell vegetables. Narrow lanes veer up and wind their way through the old city. We will walk past old dwellings clustered together on the slope and finally end up at the 16th century Leh Khar Palace and its gompa, the Temple of the Guardian Deities perched on top of the hill. Though ruined and austere for ages, Leh Palace still makes an unforgettable backdrop to the mud city. A relatively new addition to the rocky skyline around Leh is the toothpaste white Shanti Stupa above Changspa village, 3km west of Leh's bazaar. Inaugurated in 1983 by the Dalai Lama, the "Peace Pagoda", whose sides are decorated with gilt panels depicting episodes from the life of the Buddha, is one of several such monuments erected around India by a "Peace Sect" of Japanese Buddhists. We will drive from Leh to Lamayuru (110km, 3 hrs), to visit one of the most famous and spectacular gompas in Ladakh. Lamayuru Monastery is perched high on a steep cliff overlooking a strange and alien land formation called 'moon landscape'. The first Lamayuru monastery was built at the end of the 10th century. In its heyday up to 400 monks lived in the monastery but today there are only 20 to 30. We will be able to walk around the monastery and visit here the newly renovated prayer hall. From Lamayuru we will return towards Leh to Uleytokpo, where we will stay overnight in the Ule Ethnic Resort. Today we will drive to the famous 12th century Alchi Monastery, 70 km from Leh. Alchi is a religious enclave which houses an extraordinary wealth of ancient frescoes and wood sculptures. Barely a handful of the monasteries founded during this era escaped the Muslim depredations of the fourteenth century but the Alchi treasures were miraculously preserved for over nine centuries inside five tiny mud walled temples. After visiting Alchi you return to Leh, back to The Grand Dragon Hotel. We will depart from Leh to the Nubra Valley (150 km, 4-5 hrs) by crossing the Khardong La (5602m), possibly the world's highest mountain pass with a road. From the pass, one can see all the way south over the Indus Valley to the seemingly endless peaks and ridges of the Zanskar range, and north to the giants of the Saser massif. The villages in the Nubra (meaning green) Valley are irrigated and fertile, producing wheat, barley, peas, mustard for oil, and a variety of fruits and nuts, including apples, walnuts, apricots and even a few almond trees. Before partition, the Nubra Valley was a center for trade, as the famous Silk Route passed through this area. Every year, over 10,000 pack animals - horses, yaks, Bactrian camels, and an especially sturdy breed of local sheep - traversed the Nubra region, carrying Varanasi brocades, Chinese silks, pearls, spices, Indian tea, pashmina wool, salt, indigo, opium, carpets, and gold. Hundar was the capital of the erstwhile Nubra kingdom in the 17th century, and is home to the ruined Chamba Gompa. In nearby Diskit, we will visit the beautiful 15th century Monastery. This is the most important monastery in the Nurba Valley, and the various rooms are full of thankas, statues and effigies of the Buddha, and old mural paintings. A huge modern statue of Buddha overlooks the valley from a nearby hill. Between Hundar and Diskit there are several kilometers of sand dunes, and (two-humped) bactrian camels graze in the "forests" of Seabuckthorn. We will have a unique opportunity to ride on a bactrian camel amidst the sand dunes of this high altitude desert with snow-capped mountains on the horizon. We will remain at the sand dunes for photography at sunset, with the camels against a dramatic background. Overnight will be in a pleasantly located hotel in Hundar. From Hundar we will cross the Shyok river and head further north to the Samstanling Gompa, which is located in a peaceful setting overlooking the green fields of Sumur village. Parts of this 19th-century monastery have been recently restored, and feature impressive frescoes. Our next destination is the sacred Yarab Tso, which is popularly known as the hidden lake. From the road, there is a short 15 minute walk to the shore of the lake, a very beautiful place for a peaceful picnic lunch. After lunch we will continue to Panamik, which was a major stopover on the caravan trade route, and is now well known for its medicinal hot springs. We will stay overnight in a family-run hotel at the edge of Kyagar village (also known as Tigger). A late afternoon stroll through the village and the surrounding greenery is a fascinating and restful experience, and as the Nubra Valley only recently opened to foreign tourists, the friendly local Ladakhi people are pleased to welcome visitors. We will cross the Khardong La again (140km, 4-5 hrs) to return to Leh. We will stay at luxurious ﻿Grand Dragon Hotel for an additional three nights. We will drive south from Leh to the Hemis monastery, the biggest and wealthiest monastery in Ladakh. Colourful prayer flags flutter in the breeze from the four pillars in the courtyard. This is the stage for the famous 'Hemis' festival that celebrates the birth anniversary of Guru Padmasambhava. 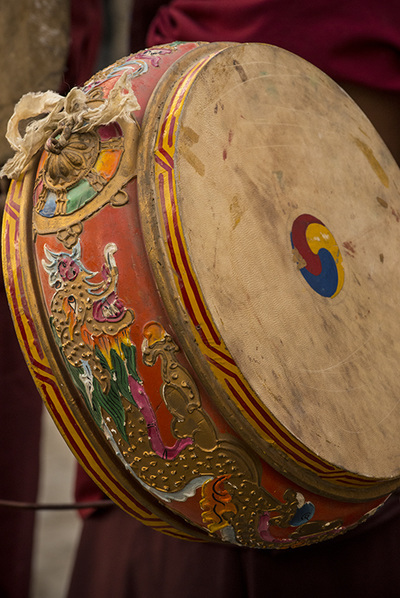 The colourful two-day pageant falls on the 10th day (Tse-Chu) of the Tibetan lunar month. The local people will be dressed up in their finest traditional garb for the occasion, while lamas, called 'chhams', perform splendid masked dances and sacred plays to the accompaniment of cymbals, drums and long brass horns. The head lama will preside over the activities. We will also visit the twelve-story 800-year-old Thikse Gompa, which is also an excellent location to witness religious ceremonies. It's a magical moment when the monks chant their prayers amidst mystical chanting, the ringing of bells, the clashing of cymbals, and the blowing of horns. Shey is the oldest of the three local monasteries and is not in regular use. The monastery contains a two-story high statue of the Buddha seated in meditation. We will be at the Shey Monastery at sunset for the best photography. Today we will transfer to Leh airport to board the early morning flight back to Delhi. On arrival in Delhi will be met and transferred to our hotel, the Radisson Blu Marina. We will have an afternoon visit to the Old Red Fort in Old Delhi. Morning sightseeing tour of Old Delhi, including the Jama Masjid, the largest mosque in India, the narrow lanes of Old Delhi, and the bustling Chandni Chowk markets. The afternoon will be free to relax and enjoy the hotel. Our tour will end after breakfast when we will be transferred to the Delhi International Airport to connect with outbound flights. The total cost of this 12 day tour is $6275.00 per person, double occupancy. A single supplement is $1550.00. A non-refundable deposit of $750.00 is required with registration to hold a space. All lodging at excellent hotels, meals and transportation. Round trip flight from Delhi to Leh. Tipping for guides and drivers although you may want to add more. It will not be expected or required. International air fares from the US to Delhi and back. This will be a cultural tour, similar to the trip taken to Nepal a few years ago for the Tiji Festival in Mustang. However, we will be staying in much nicer accommodation, have nicer vehicles and no high altitude trekking. Leh is located at an elevation of 11,500 feet and the Khardung La Pass is about 17,600 feet. We will be driving over this pass so there will not be any exertion, but you should be comfortable at elevation. It is possible to take Acetazolamide (diamox) to counter-act problems with altitude and we will stay in Leh for a few days to acclimate before going over the pass. This tour will be limited to 10 participants to keep the group small and intimate. Transportation in Ladakh will be in Toyota Innova cars, which are the largest vehicles available in Ladakh. For trip insurance, I recommend Insure My Trip. While this tour is designed with photography in mind, photographers of any skill level are welcome and encouraged. My experience on these tours has been that almost everyone wants to return with stunning images and improve their photographic skills, even those who are just beginning. I will be available to assist with questions about photography at all levels from curious beginners to advanced, and I have found that everyone's photographs improve as the trip progresses. We spend more time when photo opportunities present themselves. Many tourists visit a location and leave a few minutes later. We like to walk around, explore and view scenes from different perspectives. Whether you are an advanced photographer or a beginner, you will appreciate the time and effort we take in getting you to the right locations at the best times of day. Non-photographer spouses or friends are welcome. "I have enjoyed four wonderful photography adventures led by Douglas Steakley: Yellowstone In Winter, Burma, Iceland and a safari to Botswana and Victoria Falls. I started out knowing very little about photography other than I really enjoyed the experience of picture taking and was quickly bitten by the photo bug. Doug is an excellent teacher, he is very patient with our repeated questions and with each shoot I found a new layer of learning and how to use my equipment.